Cabin Control Travel Lift Has Complete Safety Device Low Price Terse Structure Great Choice For Lifting Boat! 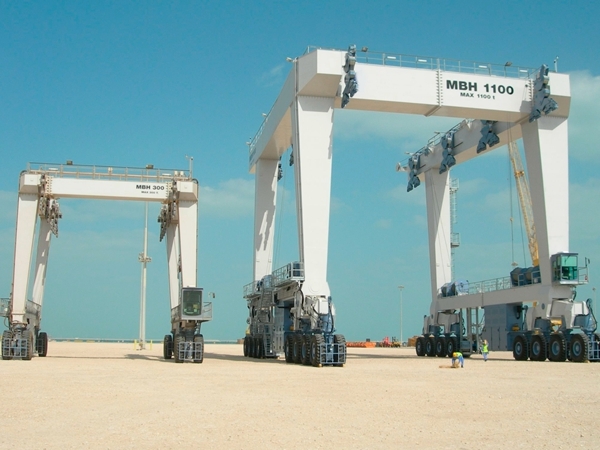 Cabin control travel lift is a very flexible and convenient lifting gantry crane. The operator can sit in the cabin and operate the machine. In this way, operator never worry about long distance, windy, cold and hot days. This makes cabin control boat hoist high efficiency and fast speed. Ellsen Group, a professional and famous marine boat hoist manufacturer in China, supplies top quality travel lifts for sale. 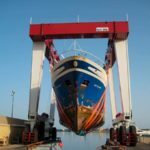 Ellsen marine travel lifts have been exported to more than fifty countries and have won high praise. Ellsen travel lift can be divided into different types. For loading capacity, it includes high lift capacity travel lift and small boat travel lift. 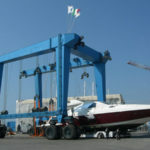 Light duty travel lift has 10t boat hoist, 25 ton portable boat hoist, 35 ton marine travel lift for sale. Heavy duty travel lift has 200 ton marine crane, 500 ton mobile boat lift gantry crane, travel lift 800 ton, 1000 ton marine travel lift. With customized service, customers can purchase the most suitable travel lift from Ellsen! Reasonable design, terse structure and simple operation! Ellsen boat hoist can save much energy and time! What are advantages of cabin control travel lift? Cabin control boat hoist is widely used for lifting, transporting and maintaining boat. It has many advantages to make lifting and transporting work easy. For convenience, the operator can operate travel lift in the cabin. Even in the windy, hot and cold day, the operator can still use the device. For safety, travel lift is kind of heavy and large lifting crane. The safety is very important for heavy lifting crane. When the operator sits in the cabin and operates the crane, safety level increases. For efficiency, the operator in the cabin can move along with travel lift at the same time. With simple operation, the operator can increase efficiency and save much time. Marine mobile boat hoists have become the gold standard for marina operators, boat yards and other boat handling operations at home and abroad. 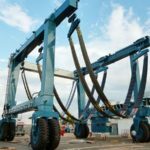 When the vessels you need to move approach 15 to 100 metric tons, you need a mobile boat hoist that’s been engineered to handle the load. And, with the Marine Travelift name, you can be sure that no shortcuts have been taken in their design, manufacturing or assembly. We’ve engineered our features specifically with your goals in mind, from enhanced yard efficiency to quieter operations. Innovative, time-tested elements include the pivot trunnion, which means less stress on the machine’s structure, special materials to extend the life of the hoses, steel and paint and specially designed slings for unparalleled support. 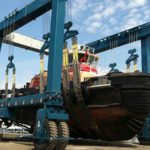 Additional significant innovations include the wireless remote control, which offers increased safety and convenience, sling adjusts that allow you to customize each lift, sailboat top beam extensions allowing additional clearance for different vessel configurations and all wheel electronic steering offering precision steering control for handling vessels with limited yard space. Our features help to optimize yard space usage and can offer the ultimate in flexible scheduling. Why choose double beam gantry crane feature, tyre gantry for yacht and small boat? 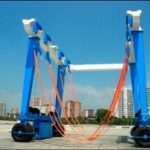 Rubber tyre boat crane is special designed for lifting boat, yacht with stable performance, high efficiency and ease maintenance, proper safety instructions and overload protection devices to maximize ensure the safety of operational personnel and equipment. 4.Using the load sensing control technique, output power will change timely according to the actual use of power, high energy saving and environmental protection. 1.Strong beams: one time forging without welding beam U frame, and carefully welding of the whole beams. This result in lower dead weight with a high degree of vertical and horizontal rigidity and smaller wheel loads. 2.End carriage: crane traveling system, motor-reducer-wheel driven system, soft start motor results in very stable starting. 3.Durable performance and high efficiency! 4.Outstanding heat resistance with thermal-protective coating added at the bottom of the main beam! 6.Special design spreader is suitable for lifting 20 feet, 40 feet and 45 feet! And we can design non-standard type according to customers’ demands. Cabin control travel lift is used for shipyard, yacht club, and water entertainment center and navy. It is also used for boat repair and maintenance work. It adopts flexible lifting belts to pull the boat bottom, multi-point lifting at the same time. Running and steering method is diverse. General speaking, it can be straight running, skew running, cross running, yaw running and pivot running. Customers can choose different configurations according to practical needs. 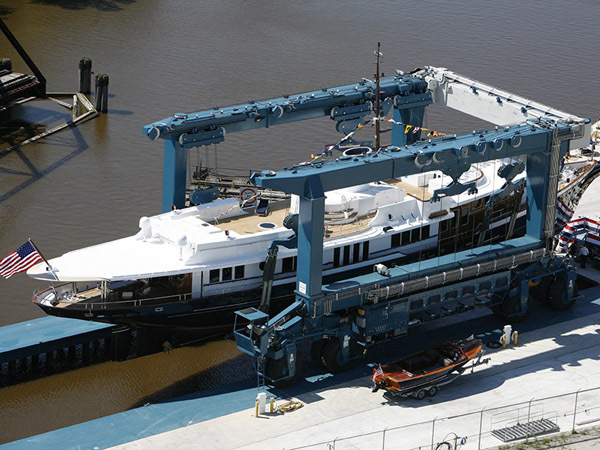 What is a cost-effective cabin control boat hoist crane? 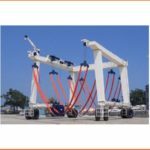 This kind of boat hoist travel lift crane is composed of leg, longitudinal beam, cross beam, hydraulic winch, crane traveling mechanism, hydraulic pump station, diesel unit and so on. For diesel unit, it can realize 12 walking functions such as straight line, oblique line, transverse line, in-place rotation and Ackerman turning to meet the requirements of different working conditions. And it has 4% climbing ability. 1.It adopts all-hydraulic driving, built-in diesel generator to provide power, good liquidity. 2.Adopt the way that traveling mechanism is hinged to longitudinal beam to eliminate the stress caused by uneven road surface when walking. 3.Lifting mechanism adopts the load-sensitive hydraulic system, the lifting point distance can be adjusted to keep the simultaneous lifting of multi-lift points and output power according to the load conditions, so that the energy consumption of the whole machine is reduced. 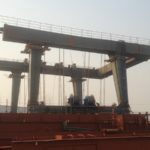 1.For the crane traveling, it can move in diagonal direction, it can also steer in 90 degree, put the boat in any designed position according to requirements. 2.It can adjust the width of the main girder according to the boat in case to handling different side boat. 3.This hoist own the performance of low expense, high performance, easy to operate and maintain. 4.Low cost on the daily operation, it adopts the soft and firm belt to ensure there is no harm to the boat when hoisting. 5.It can make the boat in order quickly, it can also adjust the gap between each boat according different condition.